Timo Glock has left his position as BMW Sauber's reserve driver after winning a race seat with Formula One rivals Toyota next season. The 25-year-old German, who joins Jarno Trulli of Italy at the Japanese team, already has F1 experience having driven in four races for Jordan in 2004. "Timo has great motorsport experience in several different categories," said Toyota Racing chief Tadashi Yamashina. 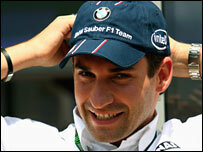 Glock added: "It's a great feeling to be a Formula One driver again." The German, who signed a multi-year contract, is understood to have been chased by Toyota for several months. Last week, Glock was ruled free to leave his post at BMW Sauber in order to take up his new role as full-time driver at Toyota, where he takes over from compatriot Ralf Schumacher. "From what I have seen of the team at the track I am confident we will be able to work well together to move forward," he added. "Even though I have not raced in Formula One since 2004, I have tested quite regularly so I expect it will take very little time for me to get back into the groove."